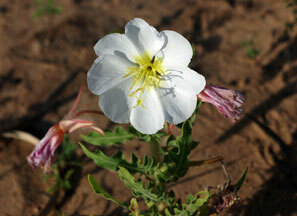 Also Called: Prairie evening primrose. Stems: Erect, single, simple or branched, short densely hairy and stiff spreading-hairy; epidermis white, not exfoliating; branches often decumbent from base. Leaves: Basal leaves oblanceolate, egg-shaped, or spatula-shaped, 1 to 5.6 inches long, entire to wavy pinnately-divided, often absent at flowering; stalks often longer than blades; stem leaves alternate, lanceolate to oblanceolate, 1/2 to 4 inches long, 1/5 to 4/5 inch wide, stiff-hairy and soft-hairy; margins wavy to deeply lobed; short stalked to sessile. Inflorescences: Solitary flowers in axils of upper leaves. Flowers: Buds nodding; floral tube slender, .6 to 1.4 inch long, sparingly hairy, gray-colored; sepals 4, distinct, linear-lanceolate, 1/2 to 1 inch long, sparsely hairy, bending abruptly backward; margins with reddish-purple stripe; petals 4, heart-shaped, .6 to 1.6 inch long, nearly as wide, white, fading pinkish; tip notched; stamens 8; stigma 4-lobed. Fruits: Capsule, sessile, cylindric, .8 to 1.6 inch long, 1/10 to 1/8 inch in diameter, ribbed, ascending, straight or slightly curved, pubescent; seeds ellipsoid, yellowish-brown, pitted, in 2 rows in each compartment. Habitat: Sandy prairies, stream valleys, roadsides, waste places; sandy soil. Distribution: West 2/5 of Kansas. Uses: Native Americans ate the fruits for food, boiled the seeds in soups, used the dried flowers used as ceremonial medicine, and smoked the plant as a tobacco substitute. Comments: Somewhat weedy. The flowers have an unpleasant odor.